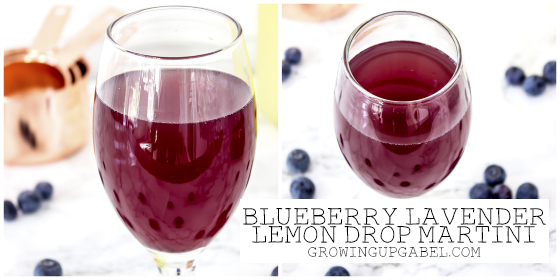 Blueberry Lavender Lemon Drop Martini is a great spring cocktail, and perfect for your Easter holiday. It's easy to make and uses a locally made simple syrup. One thing that becomes really popular around spring time is lemon. Especially with me, I love lemon. 😛 (For more proof, check out my Lemonade Beermosa Beer Cocktails!) Over the years, I've seen a lot of people mix it with blueberry (delicious), as well as lavender. You know…I've never eaten anything with lavender before. So I was intrigued. And then I went into my local liquor store looking for some inspiration for a spring martini. 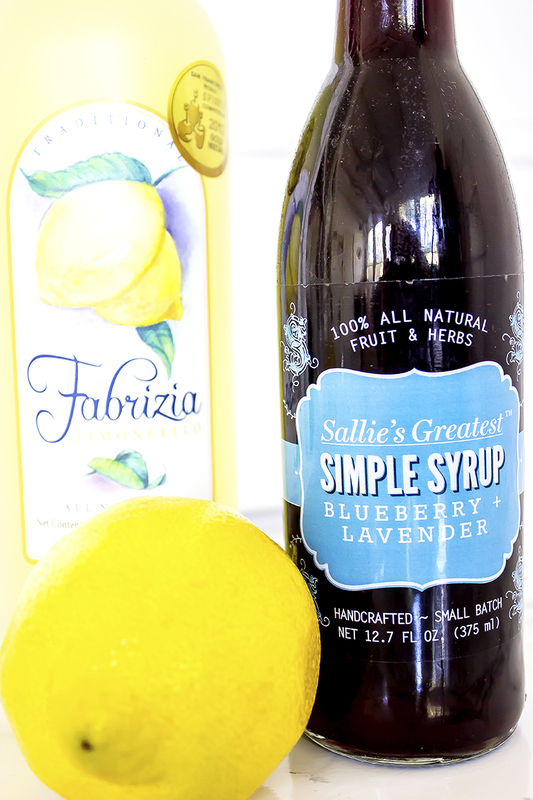 The owner directed me towards a new line of simple syrups he'd ordered, called Sallie's Greatest Simple Syrup. (Note: This isn't a sponsored post. This is just a really cool product.) I used the Blueberry Lavender syrup (obviously) and gave it a little taste before mixing it with my lemonade. And ohhh, man. Don't drink alcohol? 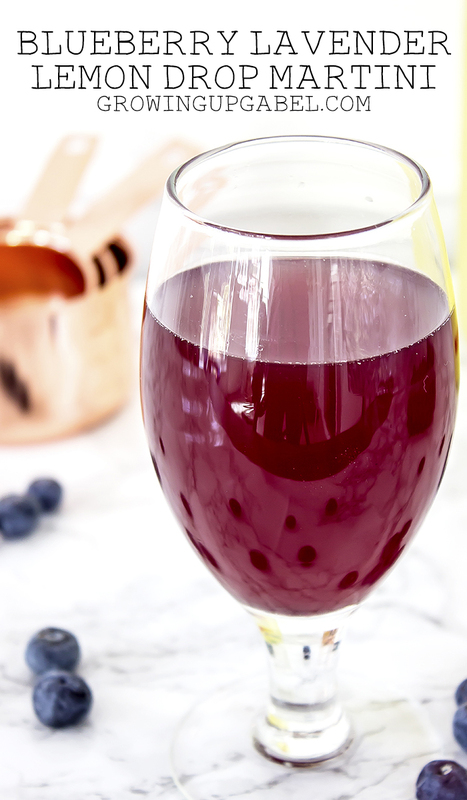 You can skip adding that part and just make a Blueberry Lavender Lemonade. It's still pretty delicious. But I like mine spiked, so I added some limoncello. I actually chose limoncello because it's also nice to sip on its own, so I knew it would get used up. Next time, though, I think I'd go for a citrus vodka for a little more of a punch. The resulting martini was just fantastic, though. So refreshing and sweet. This will be really nice for a dessert drink, or for an Easter/Mother's Day treat. …Or anything, really. If you want to check out Sallie's site, she has a lot of recipes for her simple syrups (I really want to try the mojito!). If it weren't so expensive, I'd probably use it on pancakes. Because wow. What are your favorite springtime flavors? Want more drinks for the impending warm weather? Check out these Lemon Mint Pineapple Mimosas and these Pineapple Upside-Down Cake Vodka Cocktails! For something easier? Try these Peach Beermosa Beer Cocktails! Pour each ingredient into a glass and stir to mix. Best served cold! This sounds so good – a lemon drop with lavender!! mmmm – Sorry it took so long to visit – I’ve been off on vacation! Thanks for sharing on the What’s for Dinner link up! I can imagine sipping this on a sunny patio in the summer. It sounds absolutely perfect! Hi Camille ! I see your in Vegas! I was born and raised in Vegas. Now I live in Texas. I saw this super yummy cocktail you posted on the Linky party and had to stop over and pin it! It looks so good ! thanks for the recipe! See ya around! Oh, what a great combination. I`m sure it`s so tasty! Pinning it! This does look great!! Perfect for mom (or grandma) time!! Thanks for bringing this by Throwback Thursday last week! oooh this looks good! 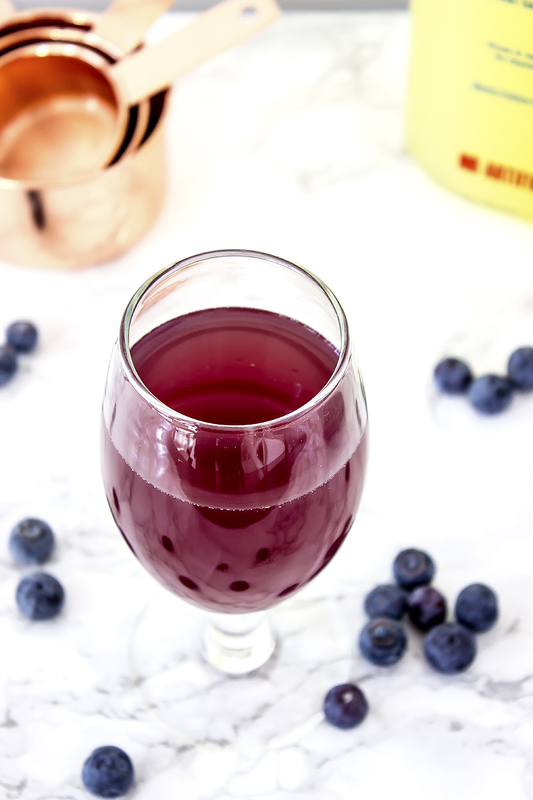 Thanks for sharing with us at #FoodieFriDIY – I’m featuring your drink this week! I adore limoncello too, and the flavor combination of this drink sounds wonderful. Thanks for sharing on the Creative K Kids Tasty Tuesdays Linky Party. I hope you will join us again next week. Thank you so much! I just changed it over a few weeks ago so I’m still getting used to it. Sounds delicious and perfect for summer!